Fire Extinguisher Inspections involve the monthly checking Fire Extinguishers to insure that the fire extinguishers are not discharged and have not leaked down, that the fire extinguisher is secure and not falling due to being hung poorly or a wall bracket being displaced, that the tamper seals are in place, that the pull pin is intact and has not become dislodged, that there is no obvious damage to the fire extinguisher externally, and most importantly that the fire extinguisher is where it belongs. This fire extinguisher inspection is the responsibility of the owner or management of the building or facility. It is also a good idea to insure that there is a Fire Extinguisher sign placed so it can be seen from a reasonable distance by anybody occupying the building or location in which the fire extinguisher is located. Upon each fire extinguisher inspection the person performing the inspection should check that the fire extinguisher sign is still intact, in place and legible. The following is a general guideline for maintenance persons, managers, owners, and others who want to know what to look for when inspecting fire extinguishers. 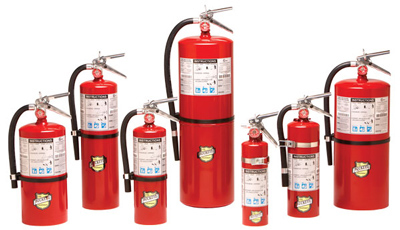 In addition to this monthly inspection that is the responsibility of the owner of the fire extinguisher per fire code NFPA 10, the fire extinguisher must also be properly serviced annually by a professional licensed Fire Protection Company. For those who do not want to go through the trouble of performing their own fire extinguisher inspection, FESCO Fire Extinguisher & Safety Service Company, LLC, New York, NY, Newark, NJ, Los Angeles, , can provide this monthly service in addition to providing annual maintenance and service on all types of fire extinguishers and we perform monthly, quarterly and yearly fire extinguisher inspections. Many times we find that fire extinguishers in restaurants and other public places have not been inspected per fire extinguisher inspection guidelines.. The next time you are in a restaurant check the fire extinguisher yourself after following the guidelines below. Check that the fire extinguisher is indeed where it belongs. Make sure that there is a fire extinguisher sign in place that can be seen from a reasonable distance. Look at the fire extinguisher gauge and check that the arrow is pointing upward in the green charged area. Make sure that the pull pin is in place. Make sure that there is a plastic tamper seal intact and holding the fire extinguisher pin in place. Make sure that the wall hanger is in place and not dislodge. Look closely at any screws or bolt and make sure they are secure. Look at the fire extinguisher exterior to make sure that it does not contain any large or deep rust, or dents. Check to see that the fire extinguisher handle/lever mechanism is intact and not bent. Also check the rivet holding this device together, to make sure it is not bent or missing. Do not use or allow others to use a fire extinguisher a door stop. Make sure the fire extinguisher tag is in place and check that the date punched on the tag. If the fire extinguisher has not been serviced within a year of last date of service, call a professional fire protection company.